I am so late in posting this and what makes it worse, its my challenge! I was so nervous as this was my first sketch for The Sketchy Challenges, so I would love you to join in. You can see my sketch here and this is my card. 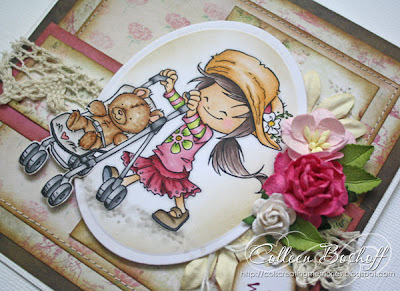 And there is a great prize to, you can win this gorgeous stamp 'Going for a Walk with Baby Teddy' - Simply Maya from Whiff of Joy. I used Glitz Design patterned papers, some lace, a mini tag, Flourish with a Bling pearls, Kaisercraft flowers and Wild Orchid flowers. Thank you for stopping by and for your lovely comments, hope to see you at The Sketchy Challenges! 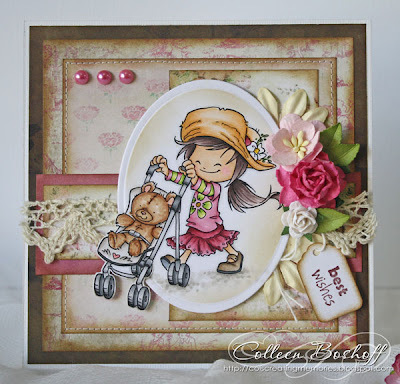 Oh, what a wonderfull card creation, looks sooooo lovely... fantastic this colours and the decoration with lace and flowers... really perfect! Darling... I like the lace trim and the springy colors.